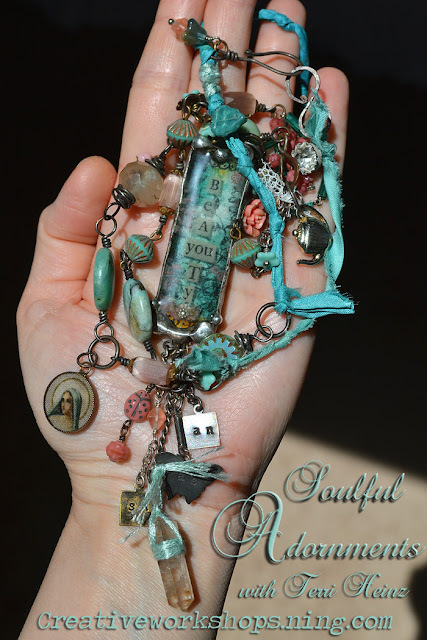 Artful Affirmations: New Class and Spring Giveaway! Again MORE beautiful jewelry! Do you ever travel to teach? Just curious ;) I would love to enter for the paper giveaway. Glad you are finally into Spring as we are here, although we went from wearing winter coats to shorts two days later! Mother nature can be a fickle lady! Lovely necklace. It reminds me of a rosary that my Grandmother had. Such a generous give away too! Thank you for the giveaway! I would love all those gorgeous papers! You're necklace is so pretty too! What beautiful jewelry and giveaway! So generous! Would love to win it! What a charming teacup. That rose looks like the Sitka Rose - it grows in my hometown of Sitka, Alaska and I've never seen a bush with the same roses on it any where else. What a lovely give-away. Spring started finely here a well and it makes me so happy! I am on my way home with my hubby, we re making a stop in Lyon where my daughter lives. Such a beautiful city, you would love it. And a you can imagine, so good to see her!! Love lovelove love the necklace!!! And the give away is so lovely, I go for the paperset! it looks gorgeous! I wish you a lovely Saturday in spring! Next time I'll go to Lourdes in France (I live not far from!) I know what I'll take for you and I'll send to you! your new necklace is just gorgeous. Goodness Terri! I'd have to toss a coin to decide which give-a-way to enter! :D :D Guess I'll go for the teacup! Your jewelry is gorgeous. I'm sure your class will be a great success. Hi Terri, The necklace is very very peaceful I agree. I have been drooling over your tea cups forever. The papers are just my style too. Thank you for the awesome giveaway. I would be thrilled to win. I love your style. We are not quite with spring yet in Colorado. Blizzard this week and snow on Mon,Tues and Wed. I am so ready for spring. Wow! what an awesome giveaway! I could have so much fun with those papers & embellies!!! Thanks! Terri I love your jewelry. Religious ephemera is one of my favorite things. Wow! What a find in Ashville! Your were certainly blessed to be gifted by your friend for the papers. What lovely and generous giveaways. You certainly will be blessed. Hopefully spring has sprung! Thank you so much for your generous heart. I would love to be entered for the pretty teacup. Glad you are enjoying your creative spirit. Terri, your new giveaways are fantastic! Yes, Please enter me in both. And the necklace you made is so lovely. I'm going to try to pick up your new class later on in the year, after I buy a small welder and work with it awhile. Many happy spring wishes to you! Holly M.
what beautiful, calm and peaceful jewelry Terri, I am impressed! And so sweet of you to do a giveaway . . . . you are giving me ideas! Please enter me in either one as I love paper & I love tea! Thank you for your visit and extra lovely comments . . .
How kind of you to do this give-away, Terri. I love paper arts and would be honored to be included. Kind regards. Hugs, Gayle. Oh what lovely pieces for the give away. Thank you for letting us try to win your beautiful gifts. I would love to try to win the thecup or the paper. I just love your wonderful blog. Thank you for a lovely site! I am new to you and so happy to be here! I would love to be included in your generous give away. Magnifique cette tasse de thé! Wow, I'm so glad I didn't miss this ... I do miss a lot lately ... love this giveaway and would be thrilled to win any of these goodies ... but love visiting your blog no matter what. Don't comment much though. 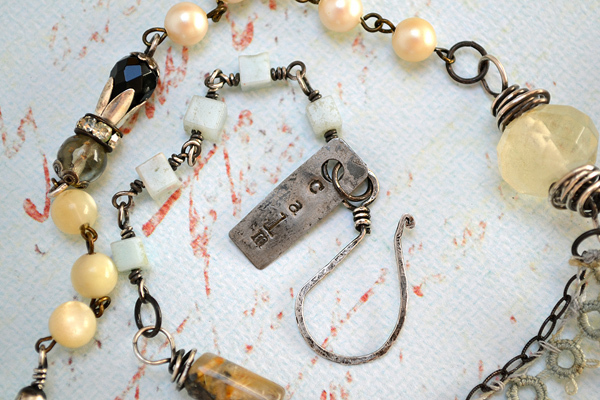 PS Love, love, love your new line of jewelry ... I love all things sacred and that imbue positive energy. I love your jewelry. It's so unique and beautiful. * I would love to be entered in your drawing. I mention you in my latest post. Dear Terri, that piece of jewelry is the most beautiful one I have seen ,with that lovely madonna image in your wonderful soldered bezel.The colours are gorgeous, I so love those aquamarine coloured beads and pearls, and the look of old rosary! I believe it is a most amazing workshop to follow! Your giveaway is very beautiful too,-that cup being so lovely, and adorable----,-but please keep me out,as you just gifted me with such amazing gifts,-my dear friend! Such a gorgeous necklace Terri. and what a very generous giveaway. I'll post it on my sidebar. I follow you via email notices whenever you have a new post. Your blog and your artwork are such a joy to view. Thank you for offering these great giveaways. Maybe I'll get lucky and win. hugs and have a great weekend. i think spring has finally sprung. Love, love, love your necklace! Truly lovel! I would love to win either giveaway. That German scrap is so adorable! Your giveaway is so incredible! I don't know how you can part with all those amazing things. You are so generous. And your necklaces are just the most dreamy creations. I love the wing with the nun. It's such a perfectly thought out piece. Inspirational art and give-away! I would love to be entered to win, and thrilled to win! Wow - what wonderful giveaways you have. :) I would love to win. I'm seriously considering your class because I love your jewelry. I just need to find those wonderful beads. Can you share where I can buy them? I always love your giveaways Terri! Count me in on number 2 please. Terri - what fabulous giveaways... OMGosh how amazing. Who wouldn't be just thrilled to have such treasures. Looking forward to the class... as "Murphy's Law" would have it - I will also be in the throngs of packing and moving! It was impromptu! LOL - Hugs from Alaska. I love all your creations. You are so very talented! Oh Terri do you realize what a wonderful talent you are dear friend? I so love the piece you are going to teach at CREATIVE WORKSHOPS as well as your recent peaceful necklace - it is so soft and dreamy. I have already placed your new Workshop and Giveaway on my sidebar and it would be such a joy to receive anything from you if I was to be the lucky winner. What a beautiful spring giveaway! That necklace is darling! So generous of you to offer these lovely giveaway prizes--your necklace is beautiful--it makes me think of all the rosaries I've had in my lifetime--as a Catholic, I love rosaries, as they are beautiful, holy, prayer beads which we use to pray to the Blessed Mother. I love all the beautiful art that you create! What a very lovely giveaway. I love the pretty tea cup. And the jewelry is beautiful. I've always thought it would be fun to make jewelry. That is such a beautiful rose teacup! I would love to have the chance to win it. I'm catching up on blogs today, and so glad I came across your awesome giveaways! 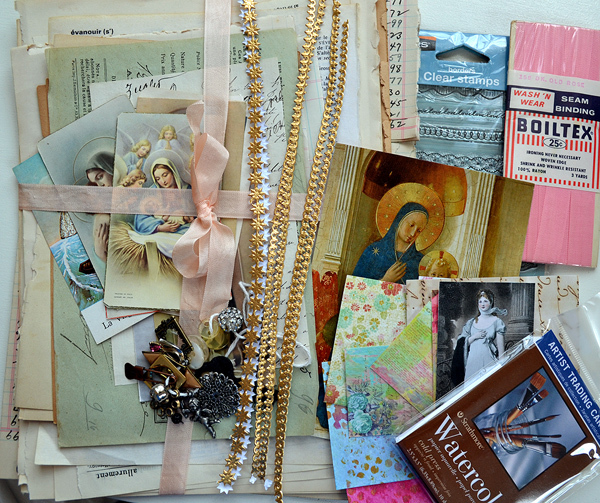 Both are so lovely, but the paper assortment, with the German scrap and beautiful religious images really looks like a treasure trove to me! Also,I LOVE the necklaces you've been making--have pinned them numerous times, and now those have be repinned by others, over and over. You do beautiful work! How wonderful to have a fabulous giveaway! Your jewelry is beautiful. You have so many creative outlets! I would love the teacup and saucer for it is a beauty! Tahnks for sharing! I am entering again for a try at your lovely teacup! Your jewery is amazing. You are so talented! That is one loverly teacup! It looks so much like Spring and boy do we need some Spring here in the northwest of England! Thank you for posting - your art is inspiring - and thank you for offering the giveaway! Seeing the lovely rose on the teacup made me think of the row of old-fashioned single roses we had in our garden at our last house. They smelled so divine and were one of my favourite things. What a gorgeous collection of little treasures! Thank you very much for the chance to be a lucky winner! That necklace is absolutely amazing! LOVE, LOVE it! Your giveaways are so gorgeous, Terri! I would provide a good home to any of them should I be lucky enough to be picked. I've mentioned your Giveaway on my blog post and put your button on my side bar! I'm drooling at the paper goodies! A gorgeous necklace - I will have a look at your class at Creative Workshops! What a wonderful stash of goodies for creating! Thanks for the sweet giveaway. I LOVE the necklace at the end of the post...DIVINE!!! Terri, I would love to win the pretty teacup! Thank you for your generous Giveaway. I love the beautiful flower vintage tea cup and the tea cup photo with the message "Taking time for tea". I enjoyed so much visiting your blog. you art so generous. I always admire your stunning tea cup, I won sometimes. Thank you for hostign such sweet give aways. You are so inspiring and generous! I would love to enter the giveaway. You have such beautiful taste and grace which I find very peaceful. 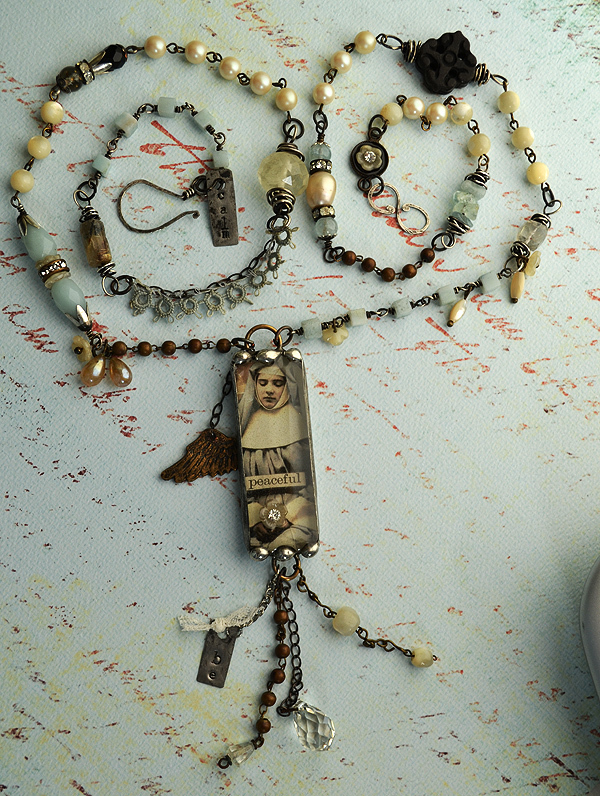 The necklace is a gorgeous piece that reminds me of my collection of vintage rosary beads. You are very generous and a beautiful person!. Oh Terri, your giveaways are amazing and so beautiful! Thank you for the opportunity to win! I am a new subscriber. I was looking for a shoe template and someone mentioned your site. So I sat and watched not only the shoe tutorial but all of your tutorials. Then I went to your blog and oh my, just the design of the blog is so serene and peaceful. Then I saw your teacups and jewelry, my, my my. I could sit for hours just looking at everything. I have always loved teacups but I am a paper crafter. So I would be honored to be entered into either of your giveaways. I tend to quietly enjoy everything, but this year I decided that I will try to step a little at a time out of my comfort zone. You site is very inspiring. I would love to enter giveaway #1! So much fun! What a lovely post today. Please add my name into your giveaway drawing. How did I ever miss this for all these days? Lucky i didn't !! Sign me up please for your generous and beautiful giveaway Terri! Terri, what beautiful jewelry (you have been busy), and such a lovely teacup. WOW! Your jewelry is just toooo wonderful. LOVE it. Please enter me in your lovely giveaway too. I am not Catholic, but just love Catholic ephemera. Just so attracted to it for some reason. Please count me in! I found you through another link. That last necklace is absolutely stunningly beautiful! Oh my! What beautiful vintage things! A lady after my own heart! I can't believe it has taken me this long to find someone who enjoys vintage ,delicate.lady like Icould go on and on! I have been looking for a vintage tea cup for my eavining tea. This would be perfect! I love [pink too! What a beautiful workshop project, Terri! Another lovely giveaway too! Thanks for a chance to win. Thank you for offering that pretty teacup. I sure would like to be entered for that and if I won, I would think of you when using it. Ps: can I borrow your ideal and call it Tea Time Tuesday? Your special giveaways just make me smile! There is nothing better than hope of adding a bit of beauty in each new day. What an awesome giveaway! Oh, count me in! Thank you so much Terri! I would love to be entered for your wonderful give-away. Thank you for the opportunity! I would love to win either giveaway. The art goodies are so inspirational . The teacup is gorgeous. I can see you sipping and creating! What pretties! I look forward to every Tuesday because I know its beauty will make me smile. I'm a paper person, so I'd love to win the ephemera prize! Thanks for brightening my day again. Beautiful work Terri, love it. Mary has been a favorite of mine since childhood. Born on the feast of the immaculate conception, we always had a half day of school. I used to say it was for my birthday. What a lovely giveaway, and being Catholic, I find it particularly lovely as are the tea cup and saucer. Oh my goodness Terri, I just ran down all the gals names, thinking I was sure I entered and didn't see mine. :) Hugs. You are talented at whatever you pick up! Lovely and calming comes to my mind when I read your blog. Thank you sharing and the wonderful giveaways! Your blog is lovely, as are your creations. When I need a calming moment, I just read back through your blog. Thanks sharing and the giveaways. Would love to win the teacup--thanks for the opportunity. Terri, I just found your lovely blog through Sandi at Rose Chintz Cottage. 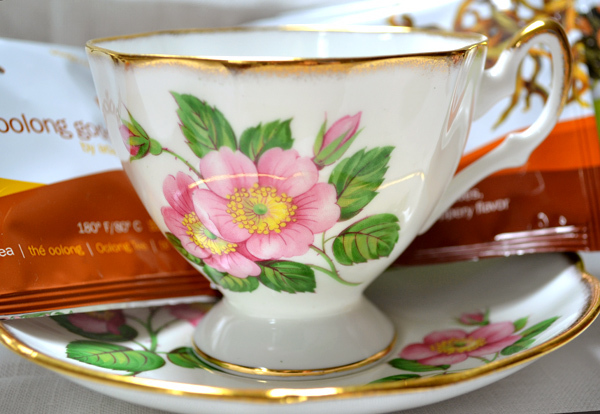 Today is the first time of linking up to your Teacup Tuesday and I saw your giveaway! It is today so I might be too late to get in on it. The teacup is so beautiful- who wouldn't want it! Love your blog and your gentle words. Please visit us at the nest. Wow!!! I just happened here by chance. What a wonderful surprise and then have a chance to win that beautiful rose teacup. Oh, happy day. I've definitely got to get on the follower' s list. Thanks so much.